A remarkable place to enjoy the beauty and wonder of Evergreen living. A comfortable and bright home designed for easy living and creating memories. 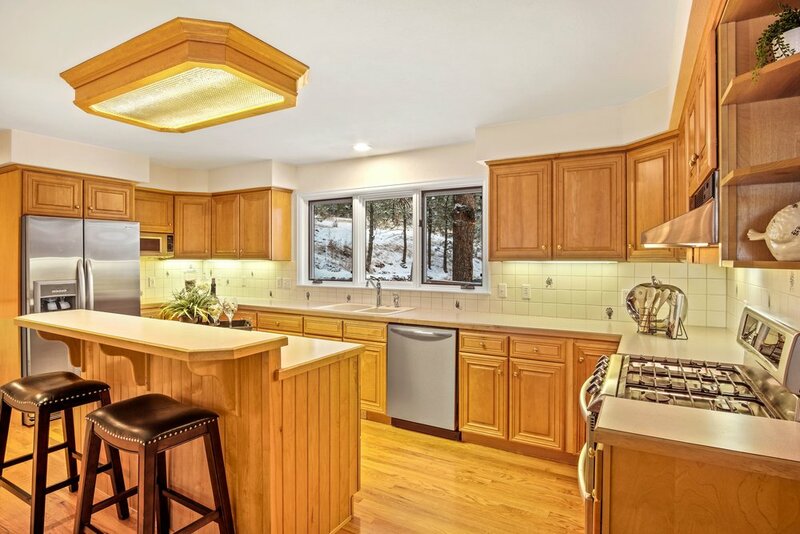 This home is nicely nestled into the woods of Hiwan Hills and is just around the corner from all of the things that make Evergreen so special. Quick access to the lake, downtown Evergreen, great restaurants and of course fast access to I-70, downtown Denver and the mountains west! The ranch style allows for daily living with no stairs and an open floor plan. The quality finished basement is bright and well designed with a second, custom granite kitchen! The master is a remarkable remodeled space with a spa like bathroom, complete with in floor radiant heat, heated towel rack, spectacular shower and huge walk in closet. Impressive. The decks and patios carry the spirit of gathering to the outdoors. Hanging swing on the patio and a fire pit on the deck to sit around create a wonderful environment in the ponderosa forest!